Ovation pool was my destination. There were lingering mounds of snow in the parking lot, broken branches and debris strewn everywhere, and no other cars in sight. A large tree had been uprooted right beside the path down to the river. It didn't look like the handiwork of a snow storm, but rather as if another hurricane had passed through. The river was high but looked safe enough for me to cross to the little island and access the pool upriver. It was still too cool and early for any bug activity, so I decided to nymph and practice once more with my 8 wt. switch rod. I tied on the exact same nymphs I had used on the Beaverkill: a big momma pheasant tail and a tiny baby pheasant tail dropper (very technical, I know ; ). It still amazes me how easy it is to cast distances and mend long lengths of line with a switch rod and shooting head line. I was able to cover a lot of water, quickly. It wasn't long before I had my first fish on, a good sized one, too. I could actually feel its movements at the end of my line. But with the 8wt. rod, I landed him all too quickly. He was my largest fish of the season on the Farmington, a 20-inch brown trout. Unfortunately, he wasn't very attractive--a mousy gray brown--lacking the fiery red markings and golden hues of the Beaverkill brown caught 2 weeks ago. (Hmmm, when did I become such a trout snob?) I tried to take a decent photo but with my line entangled in my net cord, cold hands, and the size of the fish, I wasn't very successful. I reluctantly post the picture below. As I released him, I couldn't help thinking: Damn! It would have been so much fun to land him with my 5wt. He was big, but unfortunately, not very photogenic. I nymphed a bit longer before losing my rig to a submerged rock. I thought I would try out one of my sinking tips and swing a streamer, just to get a feel for it. But as I removed the floating tip from my line, a few small blue wing olives flew by. They were a sight for sore eyes (and a sign from above?). I realized I was DONE--done with nymphing and done with my switch rod. I practically ran back to the car and assembled my 5wt., excited as a school girl. Then it hit me--I was so focused on practicing casting my new switch rod (practicing at the expense of fishing) that most of the joy was being sucked out of my time on the river. It might have been a different story if I was trying to catch salmon or stripers. 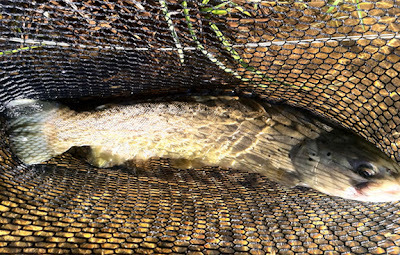 But manwomanhandling trout with it, even a 20-incher, was utterly unsatisfying. 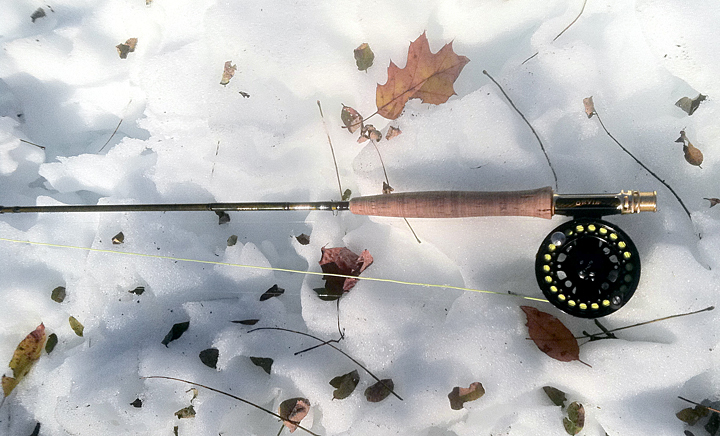 A wise fly fisherman I know recently said, "...while you're fishing is not the time to be practicing." There's truth to that. There's a time to practice and a time to fish. It was time to fish! I tied on a #20 bwo and proceeded to dry fly fish. It felt like ages since I held my 5wt. and my overhead cast was rusty, but I didn't care. It felt so light and free. I couldn't spot any rises so I blind casted into the slightly faster water above the pool. I started focusing on the fishing: placing my fly in potentially fishy seams, getting the drift just right... It was a splashy rise and agressive take--I set the hook instinctively--fish on! I'd forgotten the simple joy of watching a trout rise and take your fly. And I could feel her every shake and shimmy on my 5wt! She was a lovely 12-inch rainbow but she slipped out of my grasp before I could take her picture. I guess she was camera shy. Oh well... she certainly made my day and possibly salvaged the end of the season. H: There's a new blogger in town, our good friend and fly fishing instructor, Craig Buckbee. It's rather ironic because just the other day, he mentioned a post he read on the average angler (a blog written by a local NJ/NY fishing guide) about the overproliferation of fishing blogs. I decided to check it out for myself: Fly fishing blogs have "jumped the shark". Yes, there's a sh*tload of fishing blogs out there of varying quality. As I write this post, 20 new fly fishing blogs have probably been created somewhere in the blogosphere ;) Blogs in general are now as ubiquitous as the local Starbucks. I recall recently reading an online stat estimating over a hundred million blogs in existence--and that's a conservative estimate. Hell, I wouldn't be surprised if my 9-year-old niece, Ally, follows in her aunt's footsteps and starts a blog in the near future (with her parent's supervision and support, of course). And I hope she does, because that would mean she has discovered a passion for something and wants to share it with others. Too many blogs? Too much content? Lord knows, no one has the time to read or discover even a fraction of the multitude of fishing blogs out there. I know, I certainly don't. There's a lot of garbage to rifle through but it's worth it to find the gems and one woman's garbage is another's treasure. I find that the blogs I return to and read regularly have a clear voice that somehow resonates with me (whether funny, knowledgeable, genuine, inspiring, or just quirky and original). As the average angler notes, blogs take a lot of time and work to keep up. Hence many of these blogs will eventually fall by the wayside. The ones that survive will do so because of the passion and dedication of the blogger and the quality of the content they publish. So, where was I? Yes, back to Craig's new blog. As previously mentioned in our post: The Beauty of the Switch Rod, Craig is a certifiable casting geek (FFF certified, that is ;). But he's far from a computer geek--still getting his bearings on Blogger. His site, easterncaster, is a work-in-progress and was originally intended as a simple online business card. But who knows where it will lead. Blogs can take on a life of their own. 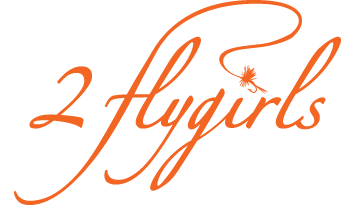 While still in its infancy (2 posts :), we have high hopes for it, wish him lots of luck, and look forward to reading—yes, another fly fishing blog!